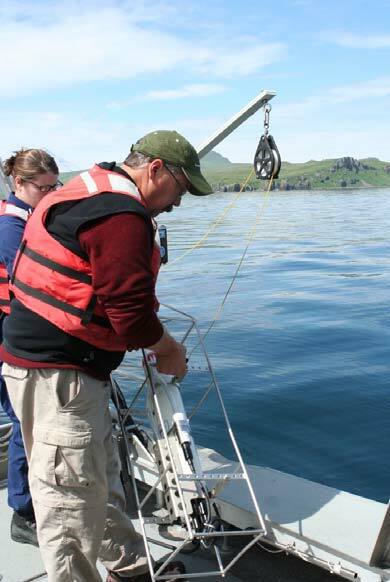 The primary mission of the Rainier is to gather hydrographic sounding data. For this leg of the summer field session, that data collection is done by a number of small launches that go out to work each day from Rainier. On a typical day four twenty-nine foot survey launches are deployed from the ship, each with an assigned area to gather data. Each launch is equipped with a multibeam sonar device that sends sound signals to the bottom and then times how long it takes for the signal to return to the receiver. Knowing how fast the signal will travel through the water, the length of time the signal takes to leave and return to the sounder determines the depth of the water at that point. Here I am preparing the CTD to take a cast. For many years sonar devices have only been able to measure the water depth directly below a survey vessel. Now, with multibeam sonar, survey vessels can cover a larger swath of seafloor with hundreds of depth measurements being taken at a time. Once the data is processed, a “painted” picture of the bottom surface can be generated. Once a launch is in its assigned work area, the sonar is turned on and the boat goes back and forth in a prescribed pattern to gather data on water depth, essentially providing total coverage of what the seafloor looks like in that area. The coxswain (person driving the launch) has a computer screen with a chart of the coverage area and steers the launch over the planned area. As the launch moves along the path of sonar coverage its path shows up on the screen as a different color, letting the driver know where the boat has been. In order for data to be interpreted accurately, there are many steps in the process from data acquisition to actual placement on a nautical chart. There is one very important piece of data that needs to be gathered in the field as the launches do there work with the sonar. Sound waves can vary in speed as they travel through water, depending on certain conditions. In order for accurate depth readings to be acquired, those conditions must be known. Therefore throughout the data gathering session, hydrographers must acquire data on the condition of the water. That is where a CTD cast comes in. CTD stands for conductivity, temperature, depth. Every few hours a CTD cast must be done in order to accurately interpret the data gathered by the sonar. The device is lowered over this side of the launch and allowed to sink to the bottom. As it descends, the CTD gathers data at various depths. When recovered the CTD is connected to a computer and its data is integrated with the sonar data to acquire more accurate depth readings. I’ve been on the Rainier now for twelve days. While there are certain routines on board the ship, there isn’t much routine about the work these people do. I continue to be impressed with how everyone applies their skills to their work in order for data to be gathered. Much of the area where we are working has never been charted before and much of what has been charted was done before World War II with lead lines (dropping a piece of lead attached to a line, and counting the measured marks on the line until it hits bottom). The details acquired by multibeam sonar are truly amazing. We will be here in the Pavlof Islands for a few more days and then head back to Kodiak, where I will get off the ship. Not long to go, but there is still much for me to learn! How long would it take you to paint an entire house with dots from a very small paintbrush? That would be like using a lead line to gather depth information. How long would it take you to paint an entire house with a very small, narrow paint brush? That would be single beam sonar. How much time could you save by using a wide paintbrush? That would be multibeam sonar. This entry was posted in 2009, Dan Steelquist, NOAA Teacher at Sea and tagged CTD sensor, data collection, gulf of alaska, Hydrographic survey, multibeam sonar, noaa ship rainier, seafloor mapping, sound waves. Bookmark the permalink.